The main object of the Finance Act was to tax the capital gain of property related to the site itself, but excluding gain from crops, buildings and improvements paid for by the owners. The value on 30 April 1909 was the baseline for later comparisons of value on sale, lease, or transfer of a property. Each unit of property was assigned an assessment number (sometimes also called a hereditament number) and two sets of plans based on large scale Ordnance Survey maps were drawn up. Working plans and other documents used during valuation often survive in local archive offices. Final record plans and assesments are held at The National Archives. Part of a record plan for Upper Deal is shown below. 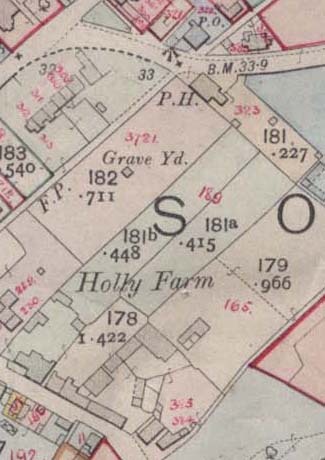 Number 165 marked in red ink shows the assessment number for one property on Neptune Farm in Manor Road. In the related field books which contain bound up sheets of 100 properties, the details given vary quite considerably; typically the name of owner and occupier, a description and the valuation, rates and rents are given. The next image shows the entry for number 165 on Neptune farm. Two other related assessments are cross referenced, however these reference numbers (164 and 187 in this case) do not appear on the plan. The table shows information extracted from the reference book. The local working documents produced to accompany the map were large bound books around 0.6m x 0.45m. For the town, the first part is a complete alpha index of all road names and named properties. This index has all the page numbers to find the properties listed in that road. The body of the book has all properties in hereditament order. They seem to have been added in blocks per owner which is why the properties are not sequentially numbered on the map. For Deal there are just 4 workbooks covering all 3700 properties. The fieldbook (page above) will have been produced later when the properties were revisited in order to get the description. The County Archive Office has a set of maps and the large bound books. 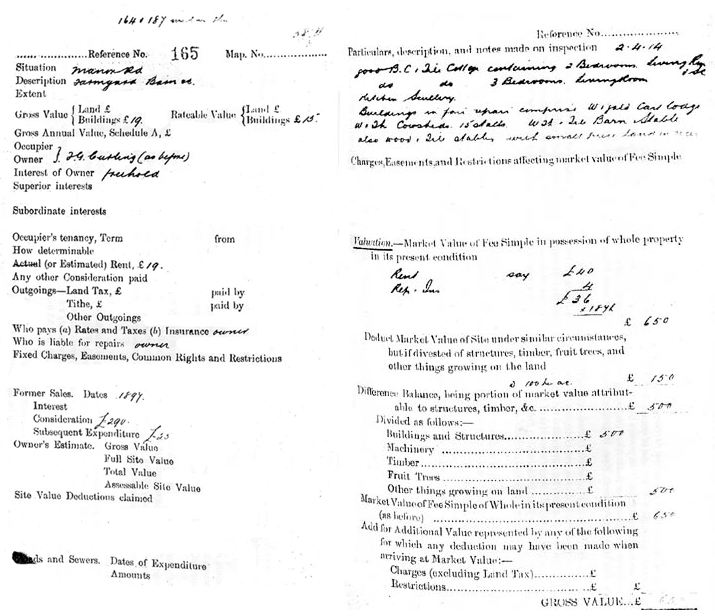 Valuation Office Records: The Finance (1909-1910) Act. The National Archives, retrieved 2010-07-18. Maps for Family and Local History. Geraldine Beech and Rose Mitchell, 2004 contains a chapter on the use of valuation survey records.